Let's face it: getting a job has its challenges. That is why the SFI Group and Kuder are here to make each individual more marketable throughout the job search. Since the SFI Group is known as the leading organization for career development for individuals, groups, communities and organizations and Kuder is an excellent career planning services, they can nurture your career path to help you get on the right track and unlock your potential to make you more competitive in the workplace. The SFI Group and Kuder partnership visions to come up with career development program that can be used in providing the much needed direction in achieving one's life's work, one's sense of meaning or purpose. Career development is life development, vital to ensure that appropriate steps are taken and decision-making is utilized to the fullest. Their advocacy is more than the corporate responsibility but more on the moral obligation to the country. Both parties plan to implement full-scale national career development strategy in addressing the needs and concerns of the different stakeholders regarding human capital development.  The need for professional trained and competent career practitioners and advocates in delivering evidence-based career services to individuals, groups and organizations.  The need for proper dissemination and utilization of career and labor market information among the different labor force categories (e.g., students, trainees, employed and unemployed).  The need to align and develop educational curriculum to be responsive to the needs of industries (e.g., 21st century skills, career development, and existing policies). 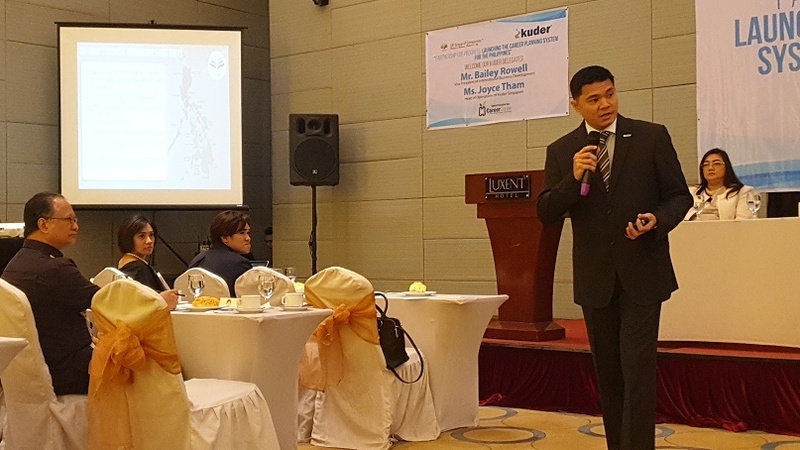 There is also a need for industries to guide the academe and government in facilitating their initiatives in developing the Filipino workforce.  The need to intensify linkage among key government agencies in spearheading the creation and implementation of career and workforce development policies and programs in responding to the issues and challenges that affect employability, and career readiness of Filipinos.  Utilize Kuder’s professional development portfolio in capacitating career practitioners (licensed and non-licensed) and career advocates (e.g., parents, teachers) in delivering relevant and responsive career services to their targeted individuals. SFI and Kuder to develop a competency-based training curricula for increasing the number of competent career practitioners in the Philippines. • Kuder may be used as a standard curriculum for the training of career advocates, life mentors, human resource practitioners, teachers, etc. on providing basic career development services; and specialized training for licensed career practitioners. Hence, addressing the issue of the lack of licensed counselors. 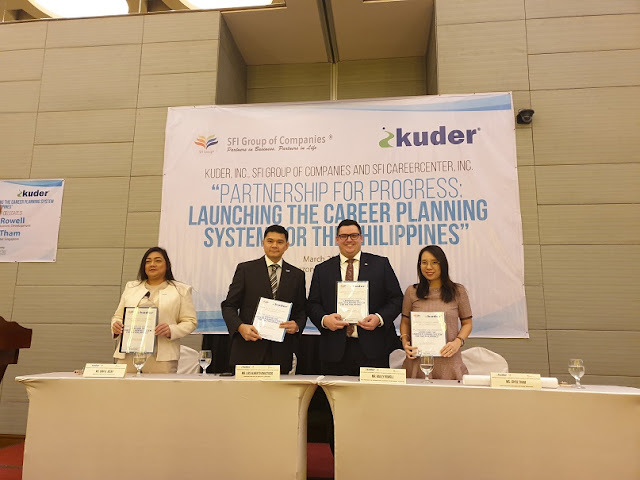 • Kuder may also be used in guiding parents, teachers and school counselors to have the necessary information and skills in providing career guidance to their children and students.  Use Kuder as a career planning tool for guiding students, trainees, employed and unemployed in utilizing career and labor market information for effective career decision making.  Develop a framework for contextualizing career development in the curriculum for career planning and use SFI-Kuder partnership as a platform for a collaborative effort between and among academic institutions, industries and government agencies in developing and in standardizing relevant and responsive career development interventions for the Philippines. Kuder has helped more than 165 million people worldwide visualize what’s next in life and make the plans to get there. Their customizable and comprehensive tools and resources—including research-based assessments and real-world, actionable guidance to users of all ages—reflect a company-wide commitment to encourage lifelong learning, development, and achievement. From pre-kindergarten to post-secondary or tertiary education, from entering the workforce to mid-career transitions, Kuder helps people of all ages dream big and plan accordingly. For more information, kindly click the Youtube link below.